Although psychoses and ethnicity are well researched, the importance of culture, race and ethnicity has been overlooked in Personality Disorders (PD) research. This study aimed to review the published literature on ethnic variations of prevalence, aetiology and treatment of PD. A systematic review of studies of PD and race, culture and ethnicity including a narrative synthesis of observational data and meta-analyses of prevalence data with tests for heterogeneity. There were few studies with original data on personality disorder and ethnicity. Studies varied in their classification of ethnic group, and few studies defined a specific type of personality disorder. Overall, meta-analyses revealed significant differences in prevalence between black and white groups (OR 0.476, CIs 0.248 - 0.915, p = 0.026) but no differences between Asian or Hispanic groups compared with white groups. Meta-regression analyses found that heterogeneity was explained by some study characteristics: a lower prevalence of PD was reported among black compared with white patients in UK studies, studies using case-note diagnoses rather than structured diagnostic interviews, studies of borderline PD compared with the other PD, studies in secure and inpatient compared with community settings, and among subjects with co-morbid disorders compared to the rest. The evidence base on aetiology and treatment was small. There is some evidence of ethnic variations in prevalence of personality disorder but methodological characteristics are likely to account for some of the variation. The findings may indicate neglect of PD diagnosis among ethnic groups, or a true lower prevalence amongst black patients. Further studies are required using more precise cultural and ethnic groups. Personality Disorder (PD) is defined by the World Health Organisation as "a severe disturbance in the characterological condition and behavioural tendencies of the individual, usually involving several areas of the personality, and nearly always associated with considerable personal and social disruption". The nature, diagnosis and categorisation of PD has been widely deliberated among mental health professionals, yet has been subjected to little empirical research . Nonetheless, a good deal of information is known regarding PD . One aspect that has been overlooked that may reveal a better understanding about the aetiology and treatment of personality disorder is the impact of culture, race and ethnicity on PD . Black and minority ethnic groups are known to be over-represented in mental health services, especially in forensic and secure settings and inpatient care. Similar studies of PD are uncommon. PD research is fraught with problems. The category of PD has been criticised as culturally biased  and that the diagnosis is a reflection of North American and Western European concepts of personality functioning . Behavioural norms in one culture may be considered deviant in another, however, there are insufficient studies addressing the role of ethnicity in diagnostic practice . This study aimed to systematically review all available published literature that addresses PD prevalence, aetiology and treatment in relation to race and ethnicity. We searched PUBMED, EMBASE, CINAHL, PsycINFO and Web of Science for studies relating to PD and race, culture and ethnicity. Searches were undertaken between the 26th February and the 7th of March 2008. Inclusion criteria were set widely for studies with original data on race and ethnic group, with personality disorder as an outcome. The subjects of the studies were adults and the settings included community, specialist mental health services and prison settings. The search was supplemented by forward and backward citation, manual exploration of references and by contacting experts in the field to refer us to any other relevant studies. Of the 391 publications identified by the search, after review of full text articles, fourteen studies met the inclusion criteria for the review. Reference tracking identified one further study resulting in a total of fifteen studies for review (see Figure 1). QUOROM flow chart of studies in the review. 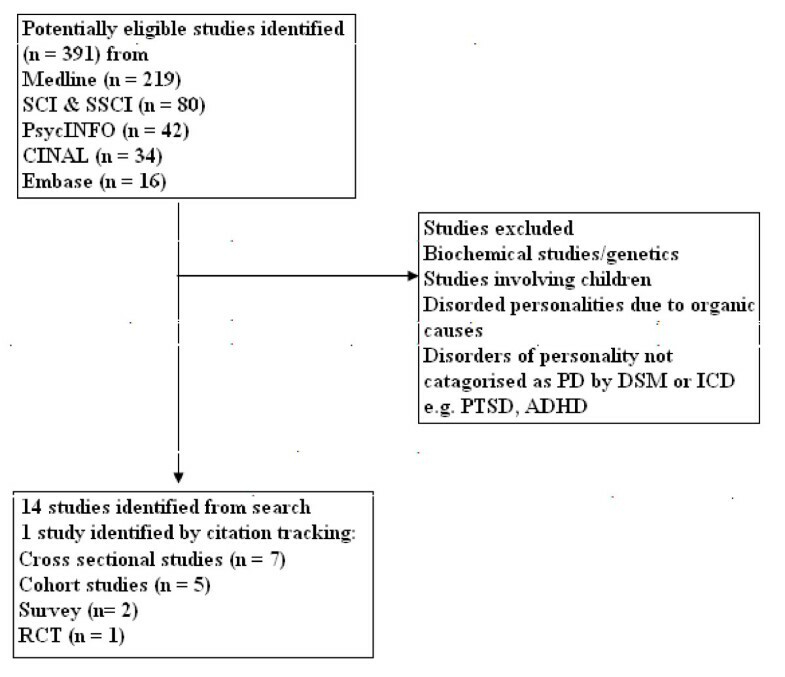 From the 15 publications (13 studies) entering the review, the following data were extracted and tabulated (Tables 1 & 2): outcome of interest (prevalence, aetiology, and treatment), description of methods used (study design, procedure, diagnostic tool, statistical methods), participants, place of study (country and setting), main effects and data points for our outcomes of interest, and strengths and limitations of each study. In addition to these, a scoring system for the methodological quality was designed by one reviewer (AM), and adapted with a second reviewer (KB) experienced in systematic review methods in order. Six domains were considered (see Table 3). Two vignettes of male patients, Afro-Caribbean or white, one suggestive of BPD the other suggestive of ASPD sent to psychiatrists. Participants chose diagnosis from list. 2 vignettes sent to each psychiatrist. All consultants and specialist registrars in forensic psychiatry in the UK included. Describe the distribution of different ethnic patient groups in Psych OPD and influence of ethnicity, on diagnosis. Retrospective study of 1,583 inpatients discharged in index year using patient notes. Patients' charts reviewed, primary psychiatric diagnosis and demographics extracted. Patients with co-existing axis I disorder diagnosis excluded. To compare community-based and standard hospital psychiatric services, including PD as an outcome. RCT of community EIS vs conventional hospital psychiatric services over 14 months for psychiatric emergency patients. Age 16-65. No alcohol/drug dependence. No mandatory care necessary. Not in contact with psych services. To estimate percentage of undiagnosed prison inmates who meet diagnostic criteria for psychiatric illness. Newly admitted patients in 5 prisons assessed for psychiatric illness. To test the hypothesis that there are systematic differences in clinical outcome in patients of different ethnic origin. All prisoners on remand or sentenced in England & Wales in 1997 included. 2 year prospective study: of patients recently treated or seeking treatment from clinical services. Follow up at 6, 12, 24 months. Random card-based task with personality characteristics to be sorted by participants' own beliefs not stereotypes. Face-to-face survey of 43093 participants by National Epidemiological Survey on Alcohol and Related Conditions (NESARC). Civilian non-institutionalised respondents aged 18+. Interview-based study of newly admitted patients. Two face-to-face interview sessions 12 months apart. Substance abusers who were recently admitted to drug treatment facilities in St Louis. PD related to Swedish origin OR 2.16, CI 1.51-3.09, p = 0.05. Results suggest PD criteria were distributed systematically such that PD diagnosis were applied to certain ethnic grps. African American given Antisocial & paranoid PDs. Schizoid PD applied to Asian Americans. Schizotypal PD applied to Native Americans. All other PDs were applied to European Americans (BPD, Dependant, Narcissistic, & Obsessive-Compulsive). All p < 0.001. The studies differed in methods and objectives. Therefore, the observational data were subjected to a narrative synthesis in order to identify common and recurring themes from different papers Of the fifteen papers, seven provided raw prevalence data by ethnic group that could be used in a meta-analysis (additional file 1). The software package Comprehensive Meta Analysis (version 2) was used to calculate odds ratios for PD in an ethnic compared to white group. Heterogeneity was calculated using I2 as this is more useful than Cochran's Q value in showing the extent of heterogeneity in small samples . A value of zero reflects true homogeneity amongst studies whilst values above this show the presence of heterogeneity. Values around I2 = 25, 50 and 75 reflect low, moderate and high heterogeneity respectively. Where I2 exceeded 75, a random effects model was used, below this level a fixed effects model was used. In order to further explore possible causes of between-study heterogeneity, meta-regression analyses were performed (see Table 4). These compared black with white groups by the following characteristics: US and UK studies; community, inpatient and prison settings; secure and non-secure inpatient settings; use of an interview schedule and no interview schedule; different diagnoses (antisocial personality disorder, borderline personality disorder and both combined); and personality disorder diagnosis alone and with co-morbidity. Age and gender of participants were not extracted as only three studies provided this data. Of the 15 studies reviewed, 9 were of moderate quality and 5 of high quality. Studies included surveys, cohorts, cross-sectional and randomised controlled trials, and took place in a variety of environments including civilian populations, prisons, forensic units, psychiatric emergency clinics, and both inpatient and outpatient settings; studies were equally from the US and the UK. Interview schedules were used to establish PD prevalence in three studies; the schedules included the NIMH Diagnostic Interview Schedule Version III-R , the Alcohol Use Disorder and Associated Disabilities Interview Schedule-DSM IV version , the Structured Clinical Interview for DSM-IV Axis II , and the Structured Clinical Interview for DSM-IV, Patient Version The other four studies relied on case-notes. In two studies [11, 12] the researchers reviewed patient notes and made the diagnostic decision according to DSM-IV Axis II criteria. One study used the primary psychiatric diagnosis given in discharge summaries from an inpatient psychiatric unit  and the other relied on diagnoses in case notes . An array of PD diagnoses were included by authors including antisocial, borderline, paranoid, schizoid, dependent, avoidant, anankastic, and histrionic. Only four studies contained data for specific diagnoses by ethnic group, these were for borderline PD [10, 13], antisocial PD [8.10], and the two combined [10, 12]. Only three studies contained prevalence data for PD alone without co-morbidity [9, 10, 13]. The prevalence data of the other studies included other psychiatric co-morbidity and substance dependence disorders. Most studies were concerned with white participants in comparison with black participants. Subgroups of the white ethnic group were not shown in any paper. Five papers failed to provide an ethnic distinction between black sub-groups [7–11]. Five studies (2 of which were scored as high quality) found black populations to have a statistically significant lower prevalence of PD than white populations [11, 12, 14–16]. One of these studies also determined that Asian populations (from India, Bangladesh and Pakistan) were also less likely to have a PD than white populations [OR 0.1, 95% Confidence Interval (CI) 0.03-0.41, p < 0.05] . However, in contrast to these findings, one large epidemiological survey of a civilian non-institutionalised population determined the weighted prevalence of PD was greater in black populations (16.6%) than white (14.6%) [p < 0.05] . Seven studies were identified as containing raw prevalence data suitable for meta-analysis (additional file 1) [8–14]. All seven studies contained data for black and white participants; in total there were 10356 black participants, and 29954 white participants. The term 'black' includes African-American, African, Afro-Caribbean, and black Other, as used by the original authors. Two studies contained data for Asian participants (n = 1412); in one study , Asian referred to those of Indian, Bangladeshi and Pakistani origin; the other study  did not define the term. Three studies included data for Hispanic participants [9, 10, 13] (n = 8815). Three studies were in the UK [11.12.14], and four were in the US [8–10, 13]. One study was based in the community , one in a prison , and five in hospital settings [8, 11–14]. The hospital settings included medium security, high security and drug and alcohol addiction units (additional file 1). The initial analyses compared Asians, Hispanic and black groups to whites. There was no significant difference in PD prevalence between Asians and whites (OR O.295 CIs 0.048 - 1.827), or Hispanics and whites (OR 1.155 CIs 0.831 - 1.606). There was, as shown in Figure 2, a significant difference between black and white populations (OR 0.476, CIs 0.248 - 0.915, p = 0.026). There was also substantial heterogeneity (I2 = 96.527). Subsequent analyses of potential sources of heterogeneity examined only black and white population data (see Table 4, Figures 3, 4, 5, 6, 7, 8, 9). The country setting, whether conducted in the US or the UK, proved to be an important source of heterogeneity (see Figure 3). There was no significant difference in the prevalence of PD amongst blacks compared to whites in the US (OR 0.872, CI 0.634-1.199, I 2 = 74.925). In contrast, there was a significant prevalence difference between black and white subjects in the UK studies (OR 0.214, 95% CI 0.167 - 0.274). The UK studies also showed true homogeneity (I 2 = 0) as shown in Table 4. There were important differences between the US and UK studies; firstly, two of the UK studies were conducted on the same population in secure settings [11, 12] and the third UK study was conducted in a similar secure hospital setting . The UK studies also used only case notes whilst the US studies used both interview schedules and case notes (discussed below). Health services subgroup; use of interview schedule and no interview schedule. Secure and non-secure health service study settings. All studies: interview and no interview use (fixed effects). Figure 4 shows that, in a comparison of three service settings (community, hospital and prison), black groups compared to white groups were least likely to have a PD in hospital settings (OR 0.357, CIs 0.188 - 0.677; 89.919) and most likely in community setting (OR 1.164, CIs 1.087 - 1.245). Of the studies in hospital settings, black patients were less likely to have PD in the secure compared to non-secure settings (Figure 6); the three secure setting studies were the three UK studies. Further meta-regression analysis of the hospital subgroup compared the use of an interview schedule and case-notes diagnoses. Where only case notes were used, the odds ratio was reduced from 0.357 to 0.281 (CI 0.169 - 0.467) (see Figure 5) and heterogeneity was reduced to I 2 = 77.274. The use of an interview schedule was found to be a source of heterogeneity (see Table 4). The pooled estimate for studies using an interview schedule showed, with a fixed effects model (as I 2 = 68.815), that the black group was in fact more likely to have a PD than the white group (OR 1.140, 95% CI 1.067 - 1.218; see Figure 7). In contrast, studies not using an interview schedule found the black group to be significantly less likely to have a PD than the white group (OR 0.281, 95% CI 0.169 - 0.467 I 2 = 77.274; see Figure 5). The interview schedule subgroup were all US studies, the non-interview subgroup included one US study and three UK studies. Only borderline personality disorder showed a significant prevalence difference between black and white groups (OR 0.575, 95% CI 0.394 - 0.840; I 2 = 0). These two studies [10, 13] were also similar as both were undertaken in the US and used interview schedules. There was also homogeneity (I 2 = 0) between the two antisocial PD studies but no significant difference between black and white groups in having this diagnosis; these studies were both in the US but used different interview schedules [8, 10]. See Figure 8. Two of the studies refer to co-morbid drug misuse and dependence but did not specify other diagnoses [12, 14]. Compton included co-morbidity with illicit substance misuse and dependence (alcohol and drugs). Trestman included co-morbidity with psychotic, affective, and anxiety disorders and PTSD with cluster A,B,C personality disorders . Coid listed many associations between different PD labels (ASPD + substance misuse, organic brain syndromes; BPD + depression, mania, substance misuse; paranoid PD + drug dependence and psychotic episodes) . In the presence of co-morbidity, black groups were significantly less likely to have a PD diagnosis than white groups (OR 0.381, 95% CI 0.190 - 0.764; I 2 = 92.288;. See Figure 9). As reflected by the high level of heterogeneity, the co-morbidity sub-group contained mixed studies in terms of setting and use of interview schedule. Where there was no co-morbidity, there was no significant difference between black and white groups (OR 0.789, 95% CI 0.432 - 1.441; I 2 = 76.081). The review found that the aetiology of PDs was the least common subject of research. One study highlighted that Hispanic populations have higher rates of intense anger and affective instability compared to white populations, but these may be manifestations of PD rather than aetiological factors . Several hypotheses about aetiology were found in the publications. It was suggested that certain groups may possess characteristics of particular PDs, migrating ethnicities may find it difficult to adjust, and that higher social classes have lower incidences of PD. Three of the five high quality scored studies considered race/ethnicity with regards to the treatment of PD [15, 18, 19]. They determined that more white patients with PD received treatment than black patients. One of these studies comprehensively evaluated types of treatment utilisation by patients with PD and concluded that black and Hispanic patients received a significantly narrower range of psychiatric treatments in spite of having higher rates of severe PD . This was true for outpatient and inpatient psychosocial treatments and psychotropic medications (p < 0.0206 and p < 0.0001 respectively). In the one RCT identified by the search strategy, which compared community services and conventional hospital-based services for PD, the majority of patients were white (63%) This study determined that those with PD showed greater improvement when treated in the hospital-based setting . The meta-analysis of seven studies determined that overall there was a small but significantly lower prevalence of PD amongst black as compared to white populations. This finding concurred with that of two of the fifteen studies which could not be included in the meta-analysis due to lack of raw data [15, 16]. There was no significant difference in prevalence between Asian and white populations, however, only two studies contained this data and it is unlikely that the term 'Asian' connoted comparable populations. The meta-analysis of three studies of Hispanic and white populations showed that Hispanics were more likely to be diagnosed with a PD, however this was not statistically significant. Where the type of personality disorder was specified, the majority of studies investigated borderline or anti-social personality disorders. Major sources of heterogeneity leading to lower prevalence estimates were the country in which the study was undertaken (US or UK), whether interview diagnoses were made rather than clinical diagnoses, the specific diagnosis of borderline PD versus others, more secure settings and patients with co-morbid disorders. These methodological differences may account for the findings, however, if case note diagnoses are associated with a lower prevalence, this means that the routine care of black patients is likely to overlook PD diagnoses, particularly if they have associated co-morbidity. A recent study using interview diagnoses in the UK investigating prevalence and correlates of PD in provides support for there being no prevalence differences between non-white and white populations . The meta-regression suggests a lower prevalence of PD or that PD is overlooked in more secure settings and in inpatient settings, where acute care is required to manage high risks. If a real difference between settings were to be found using the same methods, then questions about pathways into care and racial bias in diagnostic labelling might be asked. Similarly, the finding of a lower risk of borderline disorder is likely to reflect the differential effects of clinical and case-note diagnoses rather than interview schedules in these studies. However, these findings need replication and the development of case registers from which sufficient numbers of subjects might be gathered to test for these interactions in a more systematic and empirical manner. Very little scientific knowledge on the aetiology of PD has been collated . One study highlighted that Hispanics were found to be more intense and angry than whites , and another determined that those from ethnic minorities (mostly African Caribbean) and those in higher social classes had a lower incidence of PD . Although there are studies of higher and lower risk in specific demographic and ethnic groups [16, 17, 21, 22], few studies investigate aetiological theories. For example, Chavira et al. investigated whether some ethnic groups had increased vulnerability . Iwamasa et al. proposed that specific ethnic groups were vulnerable to particular PDs  rather than all PDs. Castaneda and Franco contend that certain migrating groups may find it difficult to adjust and this is a factor in the development of PD . If prevalence differences are genuine, then identification of different factors across ethnic groups may help in the design of studies to better understand determinants of PD. Difference in prevalence rates (inpatient and prisoner samples) may be attributed to the differences in help-seeking behaviour by ethnic group and differential effect of 'gate keeping' processes [8, 12, 15, 16, 18, 19]. Ethnic minority populations may not receive specialist care for PD, in contrast to schizophrenia where black people are over-represented in specialist care, including forensic settings. In the two studies with the highest quality scores, more white than black patients were treated for PD, yet the difference in prevalence did correspond to the lower number of black people hospitalised [15, 18], suggesting again the operation of pathway filters that diminish entry into specialist care for black people with PD. Furthermore, in the only study of treatment utilisation, PD and ethnicity, black patients received a significantly narrower range of treatments compared to white patients . Alternatively, more access to treatment may not equate to more effective treatment of PD. For example, variations in compulsory admission to hospital may reflect treatment needs or selection to treatments that appear likely to benefit patients . Bender et al. suggested that non-white patients may have received a narrower range of treatments due to differences in ethnic metabolisms, or the prescribing habits of different mental health workers but few studies replicate these findings or propose an overall theoretical framework within which research studies can lead to improved clinical practice. However, the one RCT concluded that regardless of ethnicity, patients with PD showed greater improvement in social functioning when treated in hospital as opposed to the community; this is the only study comparing different psychiatric venues for the treatments of PD . The main limitation is the small number of studies included in the meta-analysis. There was also substantial heterogeneity amongst these studies the main sources of which appeared to be study methods, setting and design. However, we stress the importance of this research as innovative. To our knowledge, this is the only review that considers existing research on PD prevalence, aetiology and treatment in relation to race and ethnicity. This research forms part of a larger project of continuing research that will look at specific PDs in relation to race and ethnicity as well as developing and reviewing PD policy involving further research and a panel of experts in the field. At present, we suggest that policy should highlight the need for clinicians to be more culturally aware, and that differences in race and ethnicity must be taken into consideration when diagnosing PDs. The existing data are sparse. There is a risk that PD is overlooked and not treated in black people with PD. More specific research in different service settings is necessary to investigate pathways to care. There is almost no aetiological and treatment research on more refined cultural and ethnic categories, leaving unexplained the reasons for differences across broad racial groups. Nick Benefield and Joe Mairura at the Department of Health, the national PD team, Care Services Improvement Partnership now transformed into the National Mental Health Development Unit, the Careif steering group, volunteers and trustees http://www.careif.org. A.M and K.S.B designed the study. A.M undertook the initial literature search and review. R.H performed the meta-analyses and meta-regression. K.S.B oversaw and supervised the study. All authors contributed to the preparation of the manuscript and read and approved the final version.